Considering that Singapore is not known for its creativity and free-thinking, the avant-garde paintings, photography and sculptures by local artists at the Singapore Art Museum may surprise you. Set on Bras Basah Road, the building was originally the home of the St Joseph’s Institution -- a missionary school that was founded by the French in 1852. It grew over the years and remained as a school until 1987 when the school moved to larger grounds. 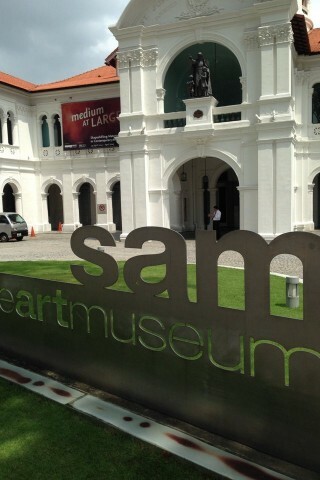 Subsequent to the move the building was refurbished and renovated and in 1996 reopened as the Singapore Art Musuem. The main gallery encompasses three levels, each with multiple halls and there’s a separate annex on Queen Street a short walk away (they refer to it as SAM at 8Q). The SAM strives to showcase art from the region and exhibitions are varied -- on our most recent visit displays included modern art from Vietnam and Taiwan along with a solid Singaporean presence. The museum can be very popular with school groups. Very. You could easily spend half a day here (depending on the exhibits) but likewise you could pop in for 30 minutes to escape the rain and take in a single display. Th Art Museum is just a few steps from an entrance for Bras Basah SMRT and when you’re done here, take a stroll up Waterloo Street for ten minutes to reach Sri Krishnan Temple and Kwan Im Thong Hood Cho Temple. Admission is free every Friday night after 18:00.